Download this free story book that parents can read to their children. Meet Joey, an amazing 3-year-old kangaroo who is very excited about all that he can do now that he is three. Joey doesn't know it, but these amazing things are called developmental milestones, and they’re a very important part of each child’s growth. 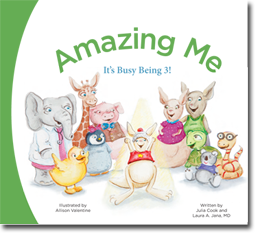 Parents, this book for children ages 2-4 will show you what to look for as your child grows and develops. Whether you read this story to your child online or have a hard copy of the book, ask your child to find the koala bears. Each page with a koala bear also has a star and milestone at the bottom just for you. See if your 3-year-old is able to do some of the same things as Joey. 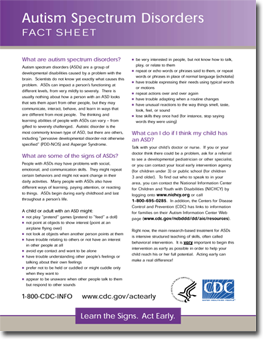 ​Download this Autism Spectrum Disorder Fact Sheet in English and Spanish. Autism spectrum disorders (ASDs) are a group of developmental disabilities caused by a problem with the brain. Scientists do not know yet exactly what causes this problem. ASDs can impact a person’s functioning at different levels, from very mildly to severely. There is usually nothing about how a person with an ASD looks that sets them apart from other people, but they may communicate, interact, behave, and learn in ways that are different from most people. The thinking and learning abilities of people with ASDs can vary – from gifted to severely challenged. Autistic disorder is the most commonly known type of ASD, but there are others, including “pervasive developmental disorder-not otherwise specified” (PDD-NOS) and Asperger Syndrome. Milestone Moments: Learn the Signs. Act Early. You can follow your child’s development by watching how he or she plays, learns, speaks, and acts. 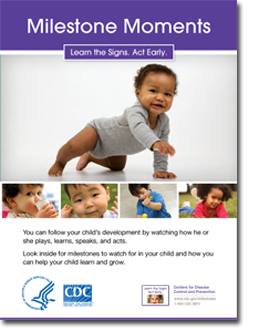 Look inside for milestones to watch for in your child and how you can help your child learn and grow. Check the milestones your child has reached at each age. This parent tool gives you a place to record each milestone as you observe it in your child. Take this with you and talk with your child’s doctor at every visit about the milestones your child has reached and what to expect next. If your family has someone on the autism spectrum, please contact AKABA now.